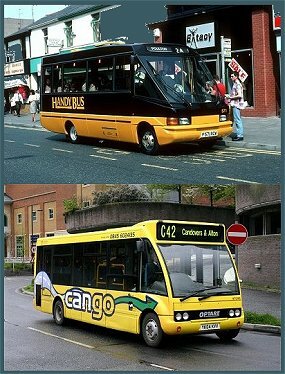 Optare is a bus manufacturer and importer based in Leeds, England. In September 1984, Leyland announced that it was closing the Charles H. Roe bodybuilding business in Leeds. In response, Russell Richardson, a former plant director at Roe, backed by the West Yorkshire Enterprise Board and many redundant former employees, created Optare in February 1985. The company was created at a very difficult time for the bus and coach industry, with the challenges of privatisation and deregulation meaning very few orders for new vehicles. The first orders came from West Yorkshire PTE and South Yorkshire PTE, keen to support local industry. West Yorkshire ordered fifteen Leyland Olympians with Optare built bodywork to the old Roe design. The first bodies to Optare's own design were Dennis Dominos for South Yorkshire PTE. However, the company had an ability to identify specific market needs and soon sought to expand its customer base by producing stylish and innovative vehicles that customers wanted. In 1986 Optare introduced is first true product, the CityPacer minibus. This was based on a heavier version of the MAN-VW LT55 van chassis, to which Optare made modifications. The engine was a six-cylinder 2.4-litre. The body seated 25, with space for a further 5 standing passengers, a size that met the minibus vogue of the late 1980s. While its competitors looked like the modified vans they were, the CityPacer had attractive styling notable for its large one-piece raked windscreen. London Transport bought 52, and other major operators bought small batches. Soon after the StarRider was introduced, based on the Mercedes 811D chassis. This was a heavier chassis with a proven reliability record. The StarRider had seating for 33 passengers, although the body styling was less successful. London Transport took 123 StarRiders. In 1988 the first full size Optare product appeared, known as the Delta. This was a single-deck bus based on the DAF SB220 chassis. The Delta bodywork featured sleek, modern styling and was aluminium with a bolted frame licensed from Alusuisse. The Delta successfully found a niche in the full-size single deck bus market, which was very limited at that time. Dennis had effectively created a new segment, known as a midibus, with the introduction of the Dennis Dart. Optare soon introduced a competitor, the Vecta. The Vecta was slightly bigger than the Dart at that time, seating 40 in a full width 2.50m body. The chassis was based on the MAN 11.190 and featured a ZF gearbox and air suspension. The body was a scaled down version of the Delta. The Spectra double-decker set new standards in design, forcing a rethink of how a double-decker should be styled. The Solo was launched and has been an overnight success for Optare. It currently competes in the same sector as the Dart and has won many orders due to its unique styling and street appeal. The Solo is currently available in four lengths with a 'Slimline' narrower option. Optare has also found some success in the US with a version of the Solo midibus where it has been mainly ordered for use at airports. In 1990, Optare joined a group called the United Bus. After the collapse of the group in 1993, Optare was again bought through management-buyout. In 2000, Optare was bought by North American Bus Industries for �21.5million. This gave Optare products exposure in the North American market.